This is the second part in our series about the Shenmue Undub versions. Last time we covered the original Undub release by Sm1th, and this time we will be looking at a version by Kogami. The Sm1th version provided Japanese audio together with English subtitles almost perfectly for the cinematic scenes, but with some issues for the free conversation sections of the game. It turned out that mixing the audio files from the Japanese Shenmue directly with the subtitle files from an English version would lead to issues since internally their structures did not correspond exactly. These problems were resolved just a few months later in a separate Undub version that was put together using a similar but extended technique. This second Shenmue Undub was created by user Kogami independently of the earlier version, and its release was announced in February 2014. 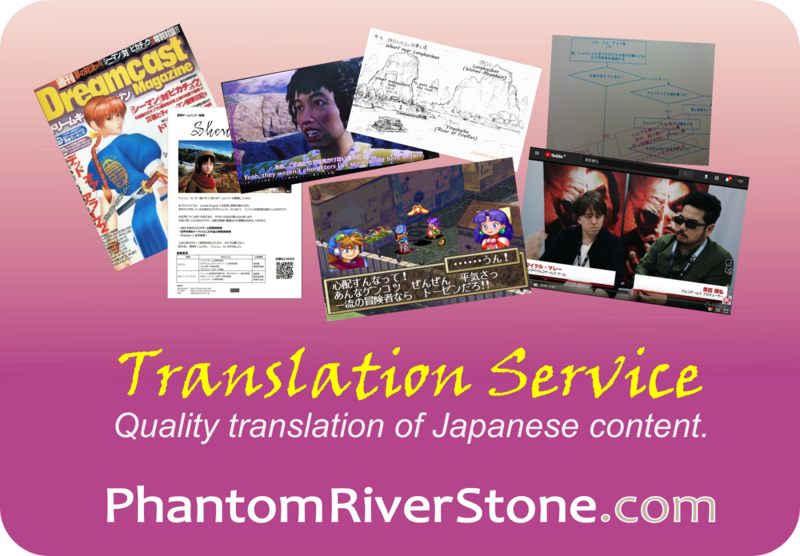 Rather than attempting to use a set of English subtitle files to go with the Japanese audio files, instead the Japanese subtitle files was used - but the subtitle text inside the files was updated to English content, leaving the rest of the file structure intact. "I replaced all the Japanese texts one by one by the English texts from the US Shenmue files to Shenmue NTSC-J version (texts + Japanese audio voice). Then I reinserted these files in the .gdi of Shenmue Pal." The process is summarized in the diagram below, which we will talk through in more detail. 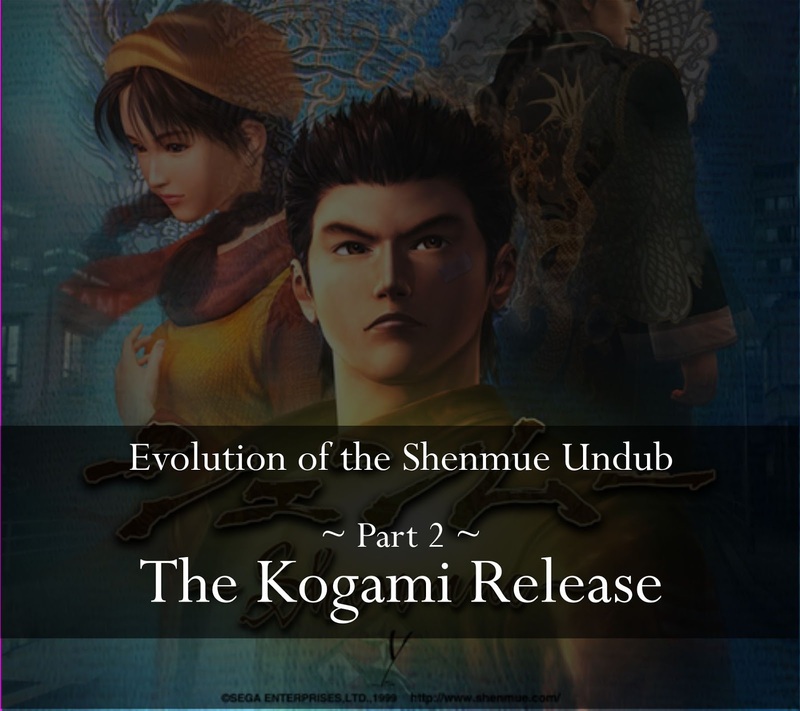 The method used to create Kogami's Undub version: first the text inside the Japanese subtitle files were updated to English using a tool; then the audio & modified subtitle files were copied into the European Shenmue. First as a preparation step the subtitles files of the standard Japanese version of Shenmue were "translated" into English; literally overwriting each of the thousands of lines of Japanese dialogue text contained within them with English equivalents, one line at a time. This laborious task was carried out with the help of a special set of Shenmue tools designed especially for editing Shenmue subtitle text (part of the amazing ShenTrad project - more about this in a future post). Fortunately there was no need to perform any actual translation work; rather it was a matter of referring to the official Shenmue English subtitles and identifying which line of text corresponded to each of the existing Japanese ones. (For this, US Shenmue proved to be convenient as a reference as it contains subtitle sets for both Japanese and English in the same disc image). 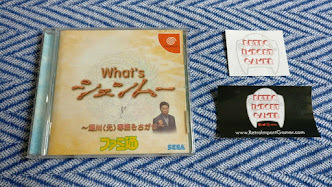 Once the Japanese subtitle files had been updated with the equivalent English lines, these subtitle files together with the set of Japanese audio files were copied across into a European (PAL) version of Shenmue. 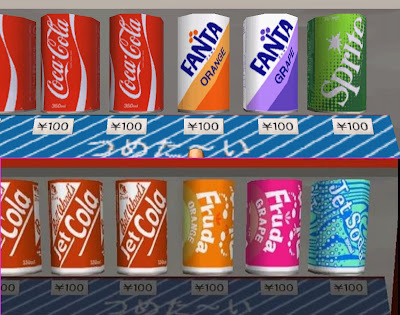 In addition, as with Sm1th's version of the Undub, various extra features were also included, such as replacing the in-game vending machine and can textures with the official Coca Cola brand versions. 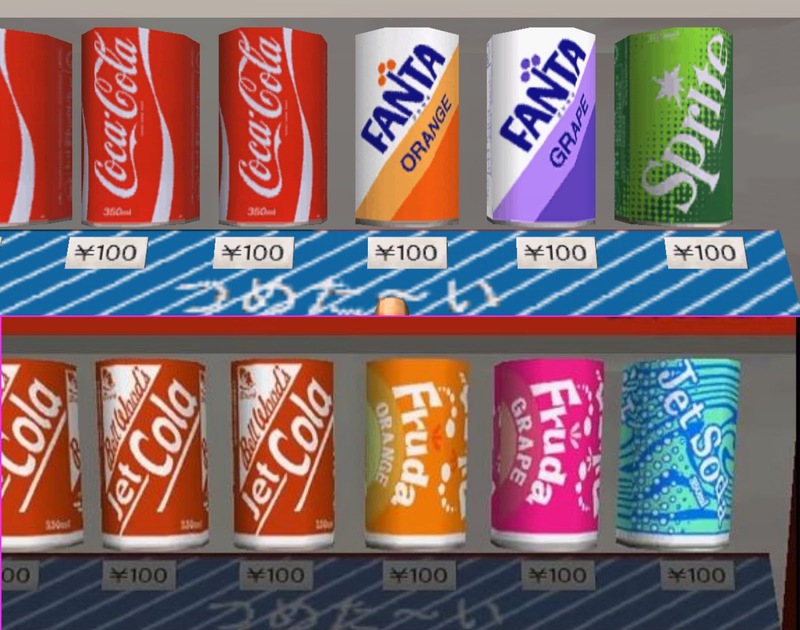 Above: the official Coca Cola branding, as found in the Japan region game, was restored in the Undub. Below: the brands used in the Europe / USA versions of the game. 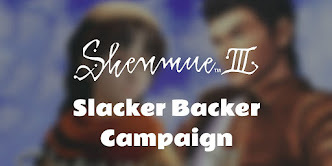 The outcome of this work was a fully-working Undub version of Shenmue 1, with full Japanese audio and support for save files that can be carried over to the PAL Shenmue II. It has been tested and confirmed on Dreamcast emulators such as Demul, as well as on actual Dreamcast hardware. Work is currently in progress on two enhancements, in preparation for an updated release. One of these relates to a small amount of subtitle text, being approximately 3% of the total text, that has not been translated to Japanese. These lines were not converted because they did not have any official equivalent subtitles in English. The untranslated text is only minor conversational text that does not have any direct bearing on the story, but it can be unexpected when the odd sentence pops up in Japanese. I am actually currently involved with translating the remaining lines - a topic I'll talk about the upcoming Part 3 of this article series. A second enhancement is to reduce the size of the disc images to fit on standard 80-minute CD-R discs, which will be for the benefit of those looking to play on a real console. They currently fit on 99-minute discs, but good-quality discs are notoriously hard to find and the burning process is fiddly. In fact, an 80-minute version of the Undub was also released by Kogami at the time, but it was withdrawn soon afterwards (due, I believe, to the presence of a bug discovered in the second disc). The focus here will be on trying to avoid loss of content and audio quality degradation, potentially by identifying and removing unused files - although easier said than done. Which Version Should I Play? Here's hoping that SEGA will surprise us with official HD releases of the first two games that support an Undub experience - but in the meantime, fans are able to do so thanks to the efforts of fans such as Sm1th and Kogami (and of course the many people who contributed to these projects behind the scenes). If you are interested in playing the Undub, the Kogami version is the most fully-realized version, and is highly recommended. And in the future, an update to this version should provide further enhancements. Coming next... Part 3 of Evolution of the Shenmue Undub: "Translating the Last 3%". Link: click here to visit the Shenmue Dojo forum thread for the Kogami Undub release. Thanks for your great feedback as always! I agree, this is a great chance to make any necessary corrections. One that I definitely want to fix is Master Chen's line about Lan Di being "the leader" of the Chi You Men. But I'm torn on whether to change some of the others. I'm thinking of leaving in some of the quirky lines like "Especially since you bought merchandise" since they are so entertaining - they are a special part of the Shenmue experience! thank you so much for all your efforts this work is amazing! Thanks! I think it's a great project that deserves to be highlighted. Should I wait for the updated version? Any idea if anyone's working on improving the Shenmue 2 Undub on the original Xbox? The current version always crashes when Yuan is about to speak. Both after the diner ambush and when you go eavesdrop on him/her with Ren. A very curious issue indeed. That sounds like a frustrating issue. Unfortunately I don't know of anyone who is working on the Shenmue 2 Undub. Uhh, a few years ago I fixed this issue. I posted on shenmue dojo asking if anyone needed help with it but till this day, no one responded. (http://shenmuedojo.net/forum/viewtopic.php?f=37&t=43947) I find it strange that there's so little interest in the shenmue 2 xbox undub. Anyway, if you're interested, I can post the fix. It'll take me a while to remember exactly how I did it. If it's any value to anyone, I have the fully functioning ISO lying around. I don't know what to do with it. The ISO I have has 0 crashes, but if I remember correctly, there's a 10 second cut-scene right after winning the Dou Niu Rooftop Fight that plays in English. Other than that, the ISO I have is completely perfect. Yeah, I suppose there's less demand for the Shenmue II Xbox undub since people have the option of the European DC version, but great that you have a fix for the issue. (ThePreciseClimber or anyone else interested: respond back with a word of interest if you'd like Stove Boat to go to the trouble of digging up the details). Stove Boat, is TheThreeevils you? Have you tried restoring the original Yuan voice? Hey Precise Climber, thethreeevils is my other username. I went ahead and found my backup of the working game. I will post a tutorial on shenmuedojo in the coming days. I'll post the link once it's up. So... was that Shenmue II Undub posted? Hey bud, sorry for such a long delay. Just messaged you a link on the Dojo. I'll add the link here also. This link will only last 30 days. Just get in touch if you don't see it in time. I've added all of the correct voice files for Scene-03 and Scene-04. Replace your files with the ones I posted and this will stop the crash. If anyone knows of a place where I can host files indefinitely, let me know and I'll post all of the fixed undubed audio. Again, sorry for the delay, life sometimes gets in the way. Got it! Tested and works perfectly. No crash in the first scene with Yuan.